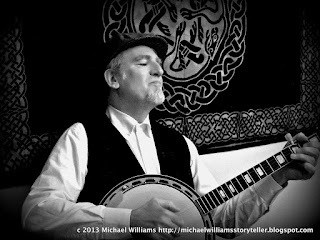 This week, host of The Teller and the Tale Michael Williams celebrates his birthday with a special programme of stories and songs. He sings about a bear he saw as a child, shares a song about what to do with a herrin's heid, and tells an old tale about the blessings of the birds. According to Michael, he was born on a hot July morning in the early '50s. That weekend, scores of flying saucers were reported swarming the skies over his birthplace and most of the north-eastern United States and Canada. Later, as a boy, the stars beckoned, inspiring young Michael to become an astronaut. He kept scrapbooks documenting the American and Russian space programmes and leapt at any opportunity in school to talk about the astronauts and cosmonauts. Sadly, an innate fear of heights, speed, and confined spaces put an end to his dreams of flying into infinity and beyond. Michael retreated into the world of the imagination, immersing himself in books and flights of fancy. He'd sit all afternoon at the top of a walnut tree dreaming he was in the crow's nest of a pirate ship on the high seas. "My home life was not a particularly happy one," Michael recalls, "so I escaped into the world of story, inventing all sorts of adventures for myself. It was inevitable that I'd become a storyteller." However, Michael's life took many detours and before he'd become a storyteller, he'd be a miner, a rug-cutter, a maker of grinding wheels and sewer pipes, a mover, a window-washer, a waiter, a dish-washer, a musician and singer, a traveller, and a counsellor to adolescents. In the 1980s he returned to University to study English Literature & Language, immersing himself in the study of stories. He married and started a family and moved to Scotland where he completed his Ph.D. in English Literature. Then for the next 15 years, he taught literature at both post-secondary and secondary school levels. As much as Michael loved teaching, an inner voice was beginning to call him to another adventure. "It was while teaching that I began my apprenticeship as a storyteller," he tells us, "spending seven years taking workshops and courses at the Scottish Storytelling Centre in Edinburgh and with the help of two mentors -- Ruth Kirkpatrick and Claire McNicol -- I got the experience I needed." In 2005, Michael left full-time teaching to become a professional storyteller. "A lot of people thought I was crazy," Michael recalls, "but I knew I had to do this, even though it took me another two years before I stopped telling people I was a teacher and I was now a storyteller." Initially, Michael was able to utilise his teaching experience with storytelling as a peace-education facilitator with Unipaz-UK, an organisation that invited children and adolescents to practice ways of feeling more peaceful and improving their relationships in schools. That led to being asked to help organise a Cross-Party Group on Creating a Culture of Peace in Scotland for the Scottish Parliament, which led to his being asked to contribute to the General Teaching Council of Scotland's Chartered Teacher Programme. Michael explains: "Essentially, I worked as an Adviser and Assessor, supporting senior classroom teachers in becoming reflective practitioners to a high level, helping them tell their stories of their professional and personal development." Michael would work with teachers for almost 8 years in this capacity as well as tutor teenagers who were struggling with exam work in high school. In 2009, he was invited to join the "Healing Words" project, which invited 12 storytellers from around the world with particular skills working with groups of children, teens, and adults. The project was inspired and led by Israeli storyteller Roi Gal-Or. Under Gal-Or's leadership, Michael and the others travelled to the Holy Land to work with Israelis and Palestinians, Arabs and Jews and others, using storytelling to encourage dialogue and mutual understanding. "It was a life-changing experience," says Michael, "during which I saw the power of story to transform people and their relationships. When I returned I saw my life's work before me." Since that time, Michael has worked as a StoryCoach helping individuals and organisations alike to find their stories and tell them more effectively. "A lot of my work," he says, "is therapeutic in the sense that I'm helping people who for any number of reasons--including poor health--are stuck in a story that no longer serves them well. I help them find more positive, healthy stories that improve their sense of well-being." He has also worked in corporate and organisational settings using story to explore issues of leadership, teamwork, and conflict-resolution. Today, Michael is an international storyteller and StoryCoach who works in both the UK and Canada. He's the host of the popular Internet radio show, The Teller and the Tale, on Blues and Roots Radio where he introduces storytellers and stories from around the world. As a StoryCoach, Michael's clients have included the Scottish Parliament, the Church of Scotland, several Scottish universities, the National Museum of Scotland, MUSEArtspace (Canada), Children 1st, Children in Scotland, Action for M.E., Macmillan Cancer Research, Arthritis Care, PAMIS, the Scottish Marine Institute, the Aberdeen Leadership Forum, and many, many others. "I owe my success to the mentors in my life," Michael says, "I've had the privilege of working closely with such storytellers and coaches as Lisa Bloom, David Campbell, Doug Lipman, Laura Simms, Michael Margolis, and Tanya Taylor Rubinstein. Without their sharing and support, I would not have made it this far. I'm so grateful for their guidance throughout these years. I'd encourage anyone in this line of work to find a mentor." Michael shares his stories on The Teller and the Tale, starting Sunday 17 July 2016 at 7am ET (Canada/US), 12 noon (UK/Ireland) and 9pm (Australia). Repeated on Thursday at 4pm ET, 9pm BST, and 6am on Friday in Australia. To listen, go to bluesandrootsradio.com at the specified time and click on the "Listen" button.